A holistic approach to living in a row house. We saw this flower box during our recent travels and thought it was too pretty not to share. 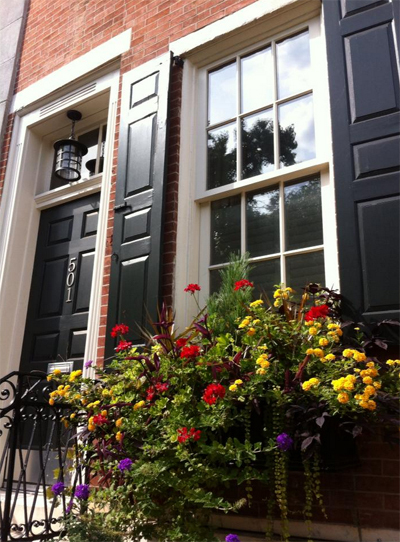 The black and white color scheme is elegant and we always love when working shutters are used. Our own row house originally had shutters but they disappeared before we moved in. One day, once we finish an unending list of very important things to fix, we’d love to add them back on. Another thing we love about this is that the window box has just gone wild and exploded. We see a lot of designed window boxes where clearly a professional or really accomplished amateur had a go at it and although the results are beautiful, you can see the formula and planning. This flower box caught our eye because it’s just all over the place and blooming in a big way. And finally, we love the light above the door. What a nice way to not only illuminate your stoop but also bring a little light indoors as well. Of course, that’s the only place for it with the shutters taking up the space where it would normally go. Previous Post: We Love Bricks! We were in Manayunk today.